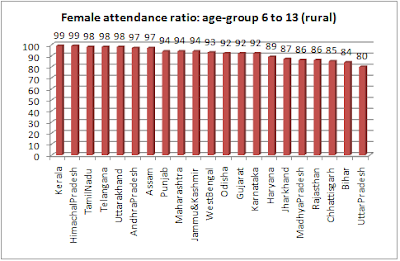 52% rural girls attend secondary school in Gujarat, worst in India, says NSS: Wither Kanya Kelavni enrollment drive? In a revelation which may prove to be a major embarrassment to the Gujarat government’s much-publicized Kanya Kalavni annual fete aimed at ensuring cent per cent attendance in school, the authoritative National Sample Survey Organization (NSSO) has revealed in its latest report, “Key Indicators of Social Consumption in India: Education”, that Gujarat has a far fewer percentage of rural girls in the age group 14-17 going to school than any of the 21 major states of India. 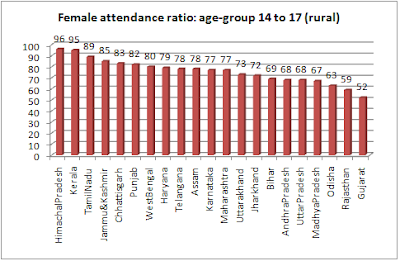 Based on NSS survey between January and June 2014, the data show that Gujarat’s just about 52 per cent rural girls attend school in the age group 14-17, as against the national average of 72 per cent. The data show that, while Kerala and Himachal Pradesh top in sending their rural girls to school with 96 and 95 per cent, even poorer states are far ahead: Assam 78 per cent, Jharkhand 72 per cent, Bihar 69 per cent, UP 68 per cent, Madhya Pradesh 67 per cent, Odisha 63 per cent, and Rajasthan 59 per cent. The NSS report was released on Tuesday. Children in the age-group 14-17 attend secondary school, suggesting that there may be a huge dropout of girls after they finish primary education. 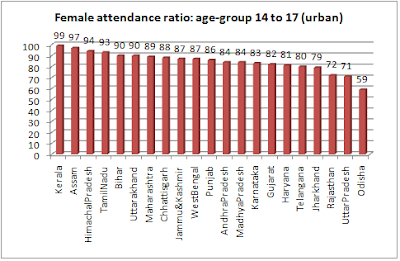 While no reasons have been assigned in the NSSO report, there is a general view among educationists and experts that distance to school (click HERE to read) and continued conservatism in rural communities (click HERE to read) are the main reasons why girls fail to go to attend school at the secondary level in Gujarat. Yet, the fact is, things are no better at the primary level. 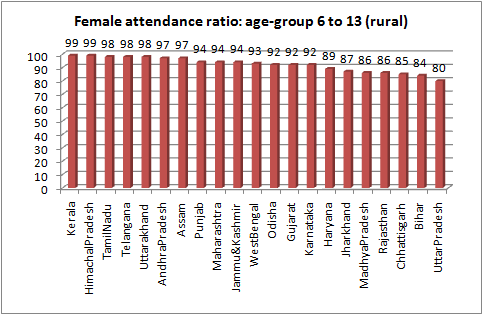 Comparative data for the age-group 6-13 reveal that Gujarat is behind as many as 11 other major states out of 21 in sending rural girls to school. While in Gujarat 92 per cent rural girls in this age group attend school, the best performer here are Kerala and Himachal Pradesh with 99 per cent each, followed by Telangana, Tamil Nadu and Uttarakhand, 98 per cent each. With two states performing equal to Gujarat (Odisha and Karnataka), only eight out of 21 major states perform worse than Gujarat. Gujarat claims to be one of the fastest urbanizing states of India. 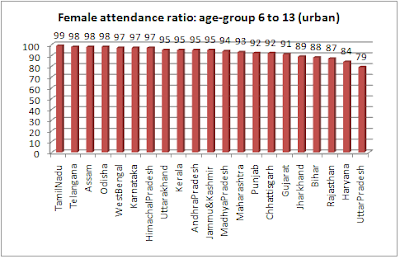 Yet education to urban girls appears to have remained a major issue, NSS data further suggest. Thus, in the age-group 14-17, Gujarat’s 82 per cent urban girls attend school, which is worse than all 21 major states with the exception of six – Haryana (81 per cent), Telangana (80 per cent), Jharkhand (79 per cent), Rajasthan (72 per cent), UP (71 per cent) and Odisha (59 per cent). 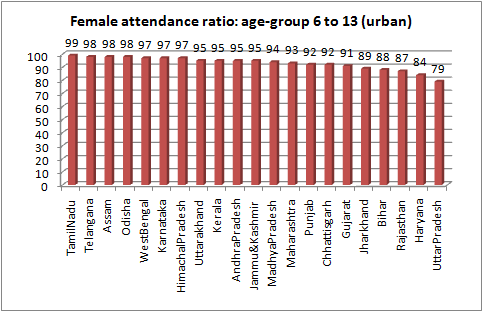 As for the age group 6-13, things are equally bad for Gujarat’s urban girls: 91 per cent of them attend school, which is worse than all major states except five – Jharkhand (89 per cent), Bihar (88 per cent), Rajasthan (87 per cent), Haryana (84 per cent) and UP (79 per cent). The best performer in primary education is Tamil Nadu, where 99 per cent urban girls attend school, followed by Telangana and Assam 98 per cent. The data come close on the heels of the just-accomplished Gujarat government-sponsored “celebration” to enroll cent per cent children at the primary level -- Shala Praveshotsav and Kanya Kelavani Mahotsav. While the annual fete in the rural areas took place on from June 11 to 13, 2015, it urban areas it happened on June 18 to 20, 2015. Government officials, ranging from IAS and IPS babus to district level class one officials, are involved in the fete, which was started by Narendra Modi about a decade ago during his chief ministership.